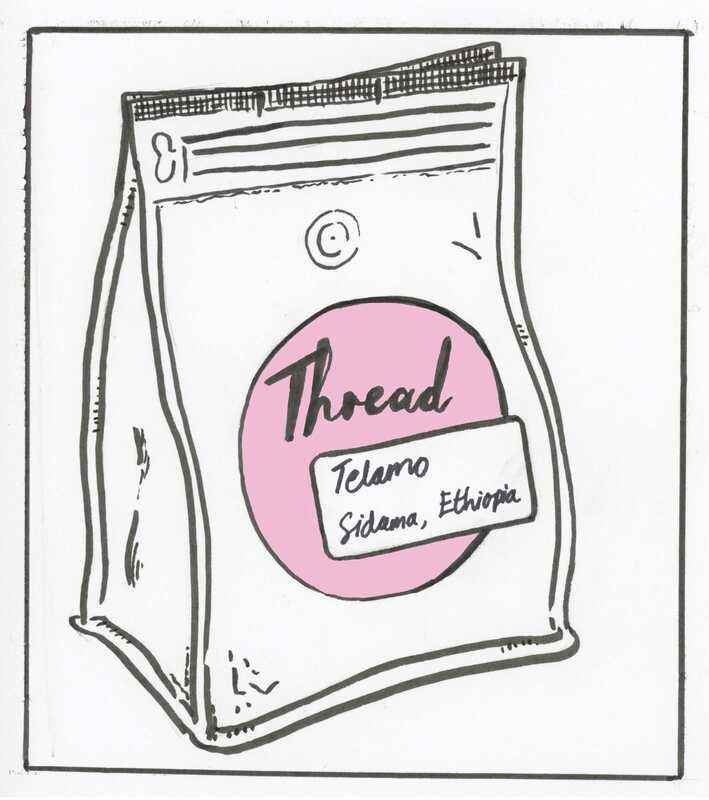 Thread Telamo - Ethiopia Region - Sidama, District of Shebedino Varietal - Heirloom Process - Unwashed Elevation - 1800-1900 m Members - 4000, since 2010 Farm Size - 0.5-3.5 Ha Tasting Notes: Wild blueberries, with hints of jasmine and cacao. Perfect in an aeropress! The Sidama Coffee Farmers Co-operative Union (SCFCU) represents coffee producing cooperatives located through out the Sidama Zone of Southern Ethiopia. This particular coffee is sourced from the Telamo Cooperative. It is a natural processed coffee, also known as unwashed coffee. This method of processing requires the beans to be dried in the cherry, a process responsible for giving the beans their well-known sweetness. Thread brings you a coffee from the Telamo farmers that has distinct blueberry aromas, with a tart and sweet fruitiness of cherries and wild blueberries, a full cacao finish with hints of jasmine. The Telamo cooperative joined the SCFCU in 2010 in order to gain access to the local and international market through a transparent organization. SCFCU is the same cooperative union where Thread gets our washed Sidama coffee, from the Fero Cooperative. SCFCU was established in 2001 and has grown to represent 51 different cooperatives, and more than 76,000 small farmers. In addition to the market access support, SCFCU is providing financial support to the Telamo cooperative as well as technical support to improve farming and processing practices. Telamo farmers and staff are working together in order to deliver a very high quality coffee. The cooperative owns four washing stations and one processing unit for natural coffee. Use coupon code 'InStorePickUp' to skip the shipping and pick up at the roastery.